Sally's Window of Scraps . : Kay is Getting Married!!! Today I made a card for a girl at work who is getting married this weekend!! She LOVES the color purple. I used the sketch at Tuesday Morning Sketches and they added a twist this week... use black, kraft and a color. I started out with a stamp from Lili of the Valley that I have been waiting to use... SO CUTE!! I colored the sweet couple in with Copics and hi-lited the bridal dress and flowers with a bit of bling (CtMH) =) The DP and purple CS is also CtMH and the Kraft CS is Recollections with raised polka dots. I wasn't sure that I was going to like the Kraft with the purple but I LOVE it!!! The White and purple flowers are from my stash along with the white organdy ribbon. Absolutely adorable Sally! I love the image and the colors. Thanks for joining us at Tuesday Morning Sketches. This is so sweet Sally! Love the adorable image. Great wedding card. 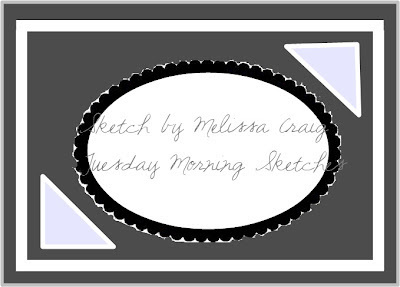 Thanks for playing along with us this week at Tuesday Morning Sketches. Hi Sally, this is just lovely. What a darling image. Thanks for joining us this week at Tuesday Morning Sketches. Oh, how sweet! Your co-worker will love it! Thanks for joining us this week at Tuesday Morning Sketches! Beautifully done, it's so elegant, love it. Thanks for joining us at Tuesday Morning Sketches this week.